Motorists could be fined for driving just 1mph over the speed limit under a zero-tolerance crackdown being considered by police chiefs. An official review is now under way into the 'buffer zone' that currently protects drivers from punishment if they go slightly too fast. And the MoS can reveal that the national roads policing chief is strongly in favour of the tougher approach, as he believes the existing leeway gives out the wrong signal and could be contributing to increasing injuries on the roads. But he faces opposition from other police leaders who fear they could not enforce the stricter rules with dwindling resources, and that they would risk losing public support if motorists believed they were being treated as cash cows. The existing rules set by police chiefs make it clear that enforcement of speed limits must be 'proportionate' and take into account how clear the signs are, what the road 'feels like' and also the accuracy of speed cameras. Drivers are effectively allowed to speed within a 'buffer zone' – calculated by increasing the speed limit by ten per cent plus 2 mph – before they will be hit with any action. 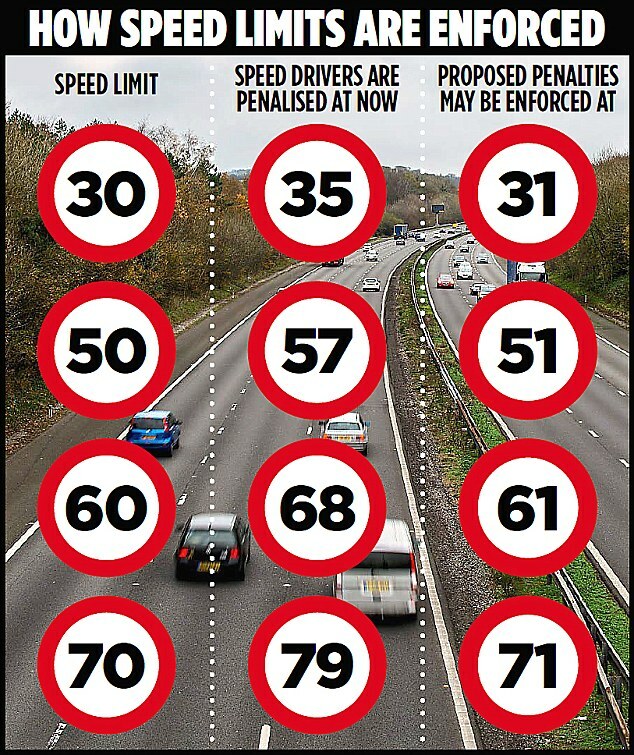 This means that a motorist could go up to 34 mph with impunity in a built-up area, and as fast as 78 mph on a motorway. Anyone caught going marginally above this buffer zone for the first time will be allowed to take a speed awareness course, while repeat offenders will be given a £100 fixed penalty notice and three points on their licence. Those who drive substantially faster will get a court summons and can face far higher fines and even disqualification. In a paper on roads policing presented to the Chief Constables' Council in April, Mr Bangham – chief constable of West Mercia Police – told how fatalities increased by four per cent in 2016 after years of decline, and admitted the police approach 'appears to be failing'. He noted that there is widespread public support for tough action against drink-drivers, those who use mobile phones at the wheel and those who do not wear seatbelts – but crackdowns on speeders are 'actively resisted' despite the fact that speeding was a factor in 15 per cent of fatal crashes in 2015. Mr Bangham went on: 'The existing speed enforcement guidance (in particular the now publicly stated 10% + 2 allowance) could in fact be encouraging driving at these more dangerous higher speeds rather than the actual speed limits. 'If properly understood and applied, the guidance may provide forces with the necessary flexibility but over time its rigid application and understanding are often misunderstood, with an expectation that the 'norm' is 'it is OK to speed'.' At the meeting, chiefs agreed that the guidelines should be reviewed. If the buffer zone were completely abolished then motorists could be punished for going just 1mph over the limit even on the fastest roads, leading to an explosion in fines but also in court challenges over the accuracy of speedometers and cameras. 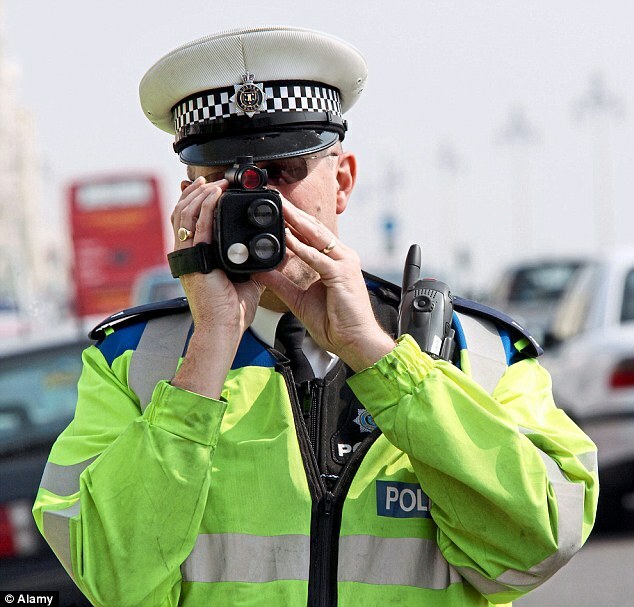 Latest Home Office figures show there were a massive 2.1 million speeding offences dealt with by fines or courts in England and Wales in 2016, up from 1.6 million in 2011, generating an estimated £100 million in income for the Government.